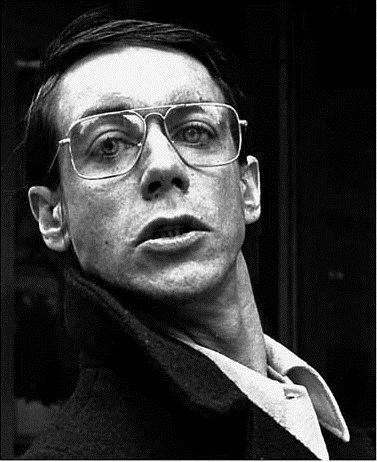 Iggy Pop’s declaration of temporary independence, “Success” was nearly rewritten from scratch once Pop got into the studio. He rejected much of Bowie’s proposed arrangement, including the initial vocal melody, which, in Pop’s words, was “some damn crooning thing” (some of it remains in the lead guitar lines). Instead Pop reduced the song: three chords*; no verses, just a series of 8-bar refrains and two 4-bar guitar solos; a half-chanted vocal line built on four beats (‘here comes suc-cess,” “in the last ditch”) with a six-beat line on the move to the F# chord (“here comes my Chi-nese rug”). Much of “Success” was owed to improvisation. Pop’s metallic-sounding vocal is due to a whim of Hansa engineer Edu Meyer, who plugged Pop’s mike into a Music Man guitar amp, while the infectious, boisterous backing vocals by the Sales brothers were done in one take, with the brothers singing lyrics basically on first sight, having had no rehearsals. In the early ’70s, Randy Newman had made his “Lonely at the Top” (a song he had intended for Sinatra) a centerpiece of his live act. The joke was that Newman, a cult act at best, was singing wearily about all the money he’s made, all the women he’s gone through. Pop’s “Success” on one level is a similar joke, Pop poking fun at his own rehabilitation, mocking the prospect of future riches. But while the song is a loopy good-natured prosperity gospel, it’s not that much of spoof. Pop had really just bought a Chinese rug for his Berlin apartment; he thought he was finally going to be a rock star, that he would finally reach the level of comfort in which Bowie existed (though his finances during this period were sometimes catastrophic, Bowie always kept up appearances). So knowing what was to come—the commercial failure of Lust For Life, the chaos of Pop’s subsequent tour, his continued misfortunes in the late ’70s and early ’80s—“Success,” with its gonzo exuberance, now sounds a bit tragic. As for Bowie, he might have been sidelined for “Success,” but he was watchful as ever: “Success,” with its sense of propulsion, the distortion and build of the vocals, and the guitar riffs that buttress the vocals, is arguably an ancestor to “Heroes,” recorded two months later. Recorded 4-20 June 1977, Hansa, Berlin. Released as a single in October 1977 c/w “The Passenger” (RCA PB 9160; didn’t chart). It’s never been performed live, as far as I could find, though you’d think this would have been an ideal stage number. * Much of the song is just B major to E major, with F# cropping up for one line. But I think the opening is D-G-D. This entry was posted on Thursday, April 7th, 2011 at 9:46 am and is filed under Lust For Life: 1977. You can follow any responses to this entry through the RSS 2.0 feed. Both comments and pings are currently closed. Poor Iggy. More than once I’ve seen the term bathos used to describe his up and down career. I also remember reading that one of the reasons the LFL album didn’t stand a chance was because soon after it was released Elvis died and RCA stopped promoting and pressing the record and started the never ending re-releases of Elvis platters. Two deaths in one hey. Love the song by the way. Covered by pop gods Duran Duran in the early nineties, when their own success was just a distant memory. I like the idea about “Success” being a forefather of “heroes.” One gets the idea that just being in Hansa was enough to stir creativity out of someone (which seems to be true of any of the albums I can think of that were recorded there). I feel like that studio (and in particular that ballroom) should be credited as a musician as much as anyone who played in it. Would the ballroom get royalties? Yeah, I’m sure that Edward and Mrs. Simpson would have cut a rug there back in the ’40s. I enjoy this track , love the backing vocals and goodtime feel. Love the Iggy pic at top of the page he looks the total opposite of his stage persona , you would not no it was him. There is little here to connect it to Bowie on listening? With the later ‘success’ of the title track of this collection it crazy to think it bombed, although not as dense as Idiot its still got some grat tracks. Pop must have been gutted doing such a good body of work to have it ignored. I wonder if he bacame more solvent after Danny Boyle used it the title track in trainspotting? The song’s backing track always felt like the link between the sonics of Diamond Dogs and Low/Heroes. Such an awesome gritty sound palette. At least one rendition I know of: It’s on the excellent bootleg of his show in Paris from September 1977. This was the second leg of his ’77-tour, after the release of ‘Lust For Life’ and without Bowie. I’d definitely recommend the acquisition of the whole gig (commonly titled ‘Live At The Hippodrome’), as it features a breathtaking rush through the songs with a bleak and raunchy (nevertheless very jovial) atmosphere much closer to a Stooges show than the relatively pedestrian tempo of the Bowie-supported shows earlier that year. In my book it’s the definitive peak of Iggy. The version of ‘The Passenger’ may be his best take ever of that song only matched by the Manchester one you can easily find on Youtube, and ‘Nightclubbing’ features him singing nearly the whole song in (quite loosely translated) German – mind you, to the french audience. As I said: Total classic, that one. On another note I can’t say how I much I enjoy reading in you blog. In my opinion this is the epitome of Bowie-related writing, trumping even Buckley and Seabrook in merging all these tiniest bits of information you can possibly find for every song and adding such insightful subjective and atmospheric commentary (not to speak of the accompanying imagery). Splendid work. Went to see Iggy at the Amsterdam HMH on Tuesday and this concert was everything I’d hoped for in Iggy. He crowd surfed several times, ran down the hall and got carried back through to the stage, swore a lot, showed a lot of chest and leg and his voice was superb. In fact his voice was incredible. The band for these gigs is awesome and they were on top form. The whole set was almost like an homage to Bowie. As he led into China Girl, Iggy looked above for a few seconds. He made a few poignant Iggy comments throughout the night and it felt right to be there. I remember Duran Duran covering this about 20 years ago but Iggy did sing it in 77 a few times there’s a boot out there – Hippodrome from Paris 77. Anyway, thank you Iggy I got to see you, life is brighter. Your gig in Amsterdam was one of the greats. Truly one of the very few people who inspired Bowie who’s around to tell it like it was (if he can remember! ).